Apps for SharePoint are small, easy-to-use, stand-alone applications that perform tasks or address specific business needs. You can add apps to your site to customize it with specific functionality or to display information such as time and expense tracking. Or you could add apps that perform various document-based tasks. You can also add apps that display news or information from third-party websites or that connect to social websites. You may be able to add apps to your site from a variety of sources. For example, if your organization has developed custom apps for internal business use, you can add these from your organization’s App Catalog by browsing the apps under From Your Organization. 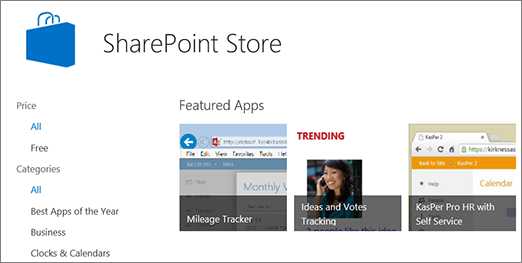 You can also buy apps from third-party developers by browsing the SharePoint store. 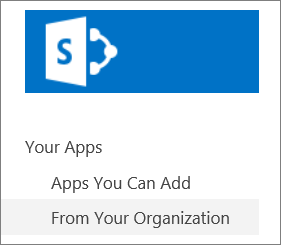 If you’ve worked with previous versions of SharePoint, note that native SharePoint features such as lists and document libraries are now considered “built-in apps,” and you can also add them by using the Add an app command. On the site where you want to add an app, go to Settings and then click Add an app. In the search box, type the name of the built-in app you want to add (for example, document library). Press ENTER. Click the app to add it, and then provide any required information. You can add multiple instances of a build-in app to a site to meet different needs. You must have at least Designer privileges to add a built-in app. Browse the filtered list of apps, and click the one you want to add. When you are asked if you want to trust the app, review the information about what the app will do, and then click Trust It to add the app. On the SharePoint Store page, use the Categories on the left to filter the selection and browse for the app that you want. Or, if you already know the name or tag for the app you want, you can type that into the search box and search for it directly. Click the app you want to add. Click Details or Reviews to learn more about the app. If you’re buying this app, use the drop-down list under the price to specify whether you are buying it for your own use, for use by several people. If required, specify the number of user licenses you want to buy. Follow the steps to log in with your Microsoft account to buy the app. When you’re asked if you want to trust the app, review the Terms & Conditions and the Privacy Statement from the app developer, and then click Trust It. The app will now appear on the Site Contents page. You can go to the app by clicking it on the Site Contents Page, which will take you to the app. You must have Full Control permissions to add apps from the SharePoint Store. You already have this if you are a Site Owner. A Microsoft account is not the same thing as a work or school account associated with Office 365. If you’re an Office 365 customer, and you don’t already have a Microsoft account, you can sign up for one using your Office 365 email address. Some apps in the SharePoint Store are free, while others are available for purchase. If your admin has not configured your site to allow users to buy apps, you may still be able to request an app. The person in your organization who manages the App Catalog site can approve or deny requests for purchasing apps. After you’ve installed an app, you can get to it by using the Site Contents page. Go to Settings , click Site contents, and then click the app to view the app page. Depending on what task the app performs, it may also do things like add commands to the ribbon in libraries, add commands to the functionality of the item callout in lists or libraries, or it may include an App Part you can add to a page.